"Men see with the eyes, God with the heart." Moses was a black man, an Ethiopian by race, the slave of a certain prominent civic official. This official got rid of him because of his lax morals and thievery. Some say that he had even committed murder, and I must be quite frank about the depth of his depravity in order to emphasize the heroic virtue of his repentance. They say that he became the head of quite a large band of robbers. Among his other evil deeds it is said that he became very hostile and vindictive towards a certain shepherd, who together with his dogs had become an obstacle in his way when he was trying to carry out a raid. He vowed to kill him, and went off to find out where the shepherd was feeding his flocks. When he was told that the shepherd was on the other side of the Nile he swam across holding his two-edged sword between his teeth and carrying on his head the tunic he had been wearing, even though the Nile was in flood at the time and over a mile wide. The shepherd had time to hide away in a cave while he was crossing, and when Moses could not find him he killed four prime rams, tied them together with a rope and swam back over the Nile. When he got to a certain small village he skinned the rams, ate the best parts of the meat, exchanged the skins for wine, drank about eighteen Italian measures of it and then set out to walk the fifty miles back to where he had left his band. This robber chief later was overcome by remorse through something which happened to him, joined a monastery and did penance according to the measure of his crimes. Among other things told about him it is said that four robbers burst in upon him in his cell, not knowing who he was. Blessed Moses succeeded in tying them up like a bundle of straw, and carried them on his shoulders to the door of the church. "I took these men in the act of attacking me, but since I may not do harm to any human person, what do you think should be done to them?" Having been captured thus by Moses, they confessed their sins to God. 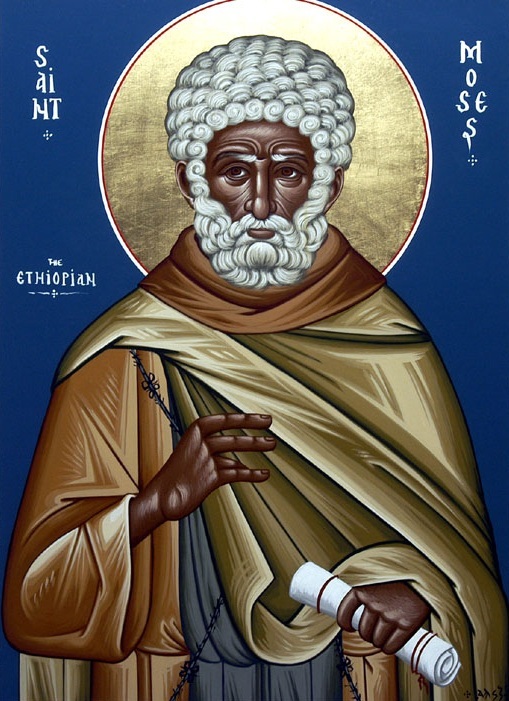 When they realized that this man was Moses, who had been the famous leader of a robber band, they glorified the name of Christ, renounced the world also, inspired by his change of heart, and ended up as most exemplary monks. "If this enormously strong man could so fear God that he turned his back on his robbery," they thought, "why should we delay in seeking our own salvation?" The demons then began to rise up against Moses the Blessed (for so we must call him), by driving him continually to violent thoughts of fornication. Up till then, so he told us, he had not been tempted by anything very much to make him renounce his calling. He went to the great Isidore in Scete and told him about his battle with fornication. "Don't worry too much, brother," the holy man replied. "They are only just beginning, but they attack the more vigorously if there is a prior welcome for them. A dog who goes into a butcher's shop to gnaw a bone will not stop doing so if he is always made welcome. But if the shop is shut and no one gives him anything he is left hungry but comes no more. So if you keep on being continent, mortifying your members which are on earth, allowing no entry to anything which might give rise to disordered gluttony, the demon will find things difficult. If there is no one to give him food he will go away." Moses the servant of Christ went back and from then onward shut himself up in his cell, testing himself to the limit, abstaining from food to the extent that he ate nothing but twelve ounces of dry bread, working constantly and saying fifty prayers a day. After a while, however, although his body became somewhat emaciated, he still remained over-stimulated, especially in his dreams. He got up and went to see a certain well-respected holy monk and said to him, "What shall I do, abba? The dreams pour out from my spirit into the darkness of my mind as if I am still taking pleasure in the things I was once was used to." "You have not turned your mind away from the visions which come into it," the holy man said, "and that is why they still continue. Follow my advice and undertake a few vigils, pray judiciously, and you will soon be free from these things." Moses listened to these words coming from the mouth of an acknowledged expert, went back to his cell and decided to do what his own conscience prompted, namely to go all night with sleep, and not to prostrate himself under the pretext of praying, in order to banish the tyranny of sleep. He spent six years standing up in the middle of his cell, without shutting his eyes, praying earnestly to God, but he still was not able to overcome his intemperate desires. After this he thought up another method of living a hard life. This adversary of Satan would go by night to the cells of those monks who had grown old in the practice of their way of life and who were no longer able to carry water for themselves without help. He would take their water jars without anyone knowing and fill them with water. They had some distance to go to get water in these places, for some it was two miles, for others five, for some only a half. The demon noticed what he was doing and decided that he could put up with the tenacity of this athlete no longer. So one night he hit him in the back with a club as he was bending over the well to fill the jar of one of the monks, and left him there for dead, ignorant of who or what it was that had hit him. Next day another monk came to draw water and found him lying there lifeless. He went to tell Isidore, that great presbyter of Scete, who came with some others, picked him up and took him into the church. For a whole year he lay there grievously ill, with body and soul scarce hanging together. Then Isidore that fine priest of Christ said to him, "Brother Moses it is time you stopped fighting with the demons and carrying on the battle in this particular way. You need some moderation in your way of life." "I will not stop fighting with them," he replied, "until the fantasies of my dreams stop." "In the name of our Lord Jesus Christ" said Isidore the presbyter, the servant of Christ, "your foul dreams will stop from this moment of time, so that with a good and faithful conscience you can receive the Sacraments. But don't boast about this as if it were through your own efforts that your desires have been tamed. It is God who has shown his power in you, to your great benefit, lest you should fall into an overrated opinion of yourself." At this Moses returned to his cell and lived more quietly, having taken up a more moderate way of life. After two or three months the blessed Isidore asked Moses whether the demon had been giving him any more trouble, to which he replied, "From the moment when the servant of Christ prayed for me nothing of that sort happened any more." But this holy man was found worthy of being given grace in his fight against the demons. He became as free from the attentions of demons as of flies in wintertime. Such was the holy ascetic life lived by the indomitable athlete, Moses the Ethiopian, who was numbered among the great. He became a presbyter and died in Scete aged seventy-five, leaving behind him seventy-five disciples. From The Lausiac History, Bk. 8, Ch. 22. 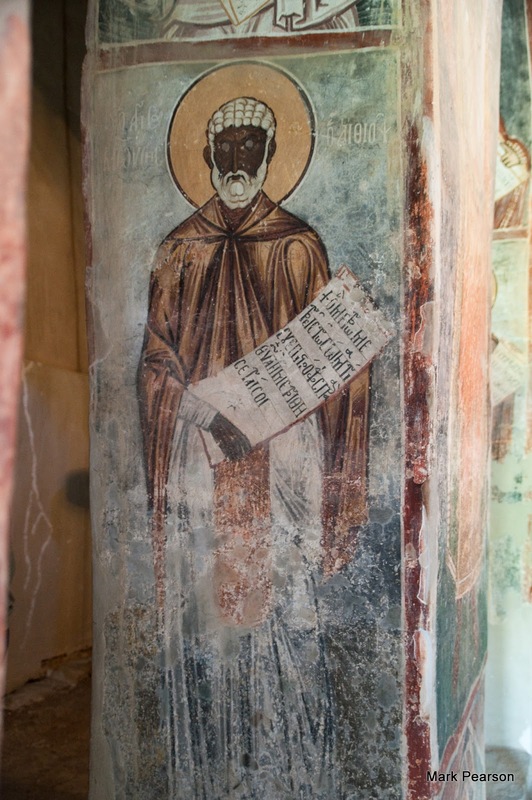 You abandoned the Egypt of the passions, O Father, ascending the mount of the virtues with fervent faith, taking the Cross of Christ upon your shoulders; and being glorified in godly works, you proved to be a model for monastics, O summit of the fathers. Pray unceasingly with them that our souls may find mercy. Ethiopian faces, you thoroughly thrashed, noetically you shined, like the bright sun, illuminating our souls, we who honor you, blessed Moses. You shined brightly through your ascetic works, the intelligent enemy you blackened by your strength, you showed yourself to be an inheritor of the glory above, companion of the Bodiless Angels, blessed Moses.